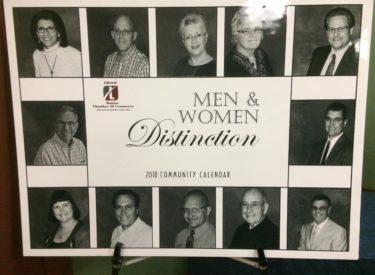 The Liberal Chamber of Commerce unveiled its annual Men and Women of Distinction Calendar Tuesday evening at the Rock Island Depot. Those included on the 2018 calendar are: Debbie Sumner, Craig Hay, Toni Smith, Ada Linenbroker, Dr. Todd Carter, Jay Hay, Luke Dowell, Holli Horyna, Marvin Chance, Troy McCarter, Bruce McPhail, and Rick Potts. The calendars are free and available at the Chamber office.